Messier 32 (also known as M32 and NGC 221) is a dwarf "early-type" galaxy located about 2.65 million light-years from Earth, appearing in the constellation Andromeda. M32 is a satellite galaxy of the Andromeda Galaxy (M31) and was discovered by Guillaume Le Gentil in 1749. M32 measures 6.5 ± 0.2 thousand light-years in diameter at the widest point. The structure and stellar content of M32 are difficult to explain by traditional galaxy formation models. 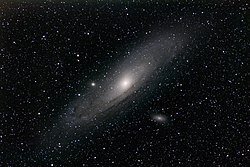 Theoretical arguments and some simulations suggest a scenario in which the strong tidal field of M31 can transform a spiral galaxy or a lenticular galaxy into a compact elliptical. As a small disk galaxy falls into the central parts of M31, much of its outer layers will be stripped away. The central bulge of the small galaxy is much less affected and retains its morphology. Gravitational tidal effects may also drive gas inward and trigger a star burst in the core of the small galaxy, resulting in the high density of M32 observed today. There is evidence that M32 has a faint outer disk, and as such is not a typical elliptical galaxy. Newer simulations find that an off-centre impact by M32 around 800 million years ago explains the present-day warp in M31's disk. However this feature only occurs during the first orbital passage, whereas it takes many orbits for tides to transform a normal dwarf into M32. The observed colours and stellar populations of M32's outskirts do not match the stellar halo of M31, indicating that tidal losses from M32 are not their source. Taken together, these circumstances may suggest that M32 already began in its compact state, and has retained most of its own stars. At least one similar cE galaxy has been discovered in isolation, without any massive companion to thresh it. Another hypothesis is that M32 would be in fact the largest remnant of a former spiral galaxy, M32p, which was then the third largest member of the Local Group. According to this simulation, M31 (Andromeda) and M32p merged about two billion years ago, which could explain both the unusual makeup of the current M31 stellar halo, and the structure and content of M32. At least two techniques have been used to measure distances to M32. The infrared surface brightness fluctuations distance measurement technique estimates distances to spiral galaxies based on the graininess of the appearance of their bulges. The distance measured to M32 using this technique is 2.46 ± 0.09 million light-years (755 ± 28 kpc). However, M32 is close enough that the tip of the red giant branch (TRGB) method may be used to estimate its distance. The estimated distance to M32 using this technique is 2.51 ± 0.13 million light-years (770 ± 40 kpc). For several additional reasons, M32 is thought to be in the foreground of M31, rather than behind. Its stars and planetary nebulae do not appear obscured or reddened by foreground gas or dust. Gravitational microlensing of M31 by a star in M32 was observed in one event. M32 contains a supermassive black hole. Its mass has been estimated to lie between 1.5 and 5 million solar masses. A centrally located faint radio and X-ray source (now named M32* in analogy to Sgr A*) is attributed to gas accretion onto the black hole. ^ a b Jensen, Joseph B.; Tonry, John L.; Barris, Brian J.; Thompson, Rodger I.; Liu, Michael C.; Rieke, Marcia J.; Ajhar, Edward A.; Blakeslee, John P. (2003). "Measuring Distances and Probing the Unresolved Stellar Populations of Galaxies Using Infrared Surface Brightness Fluctuations". Astrophysical Journal. 583 (2): 712–726. arXiv:astro-ph/0210129. Bibcode:2003ApJ...583..712J. doi:10.1086/345430. ^ a b Karachentsev, I. D.; Karachentseva, V. E.; Hutchmeier, W. K.; Makarov, D. I. (2004). "A Catalog of Neighboring Galaxies". Astronomical Journal. 127 (4): 2031–2068. Bibcode:2004AJ....127.2031K. doi:10.1086/382905. ^ "M32". SIMBAD. Centre de données astronomiques de Strasbourg. Retrieved 2009-11-29. ^ Kent, S. M. (1987). "Surface photometry of six local group galaxies". Astronomical Journal. 94: 306–314. Bibcode:1987AJ.....94..306K. doi:10.1086/114472. ^ Mateo, M. L. (1998). "Dwarf Galaxies of the Local Group". Annual Review of Astronomy and Astrophysics. 36: 435–506. arXiv:astro-ph/9810070. Bibcode:1998ARA&A..36..435M. doi:10.1146/annurev.astro.36.1.435. ^ Lauer, T. R.; Faber, S. M.; Currie, D. G.; Ewald, S. P.; Groth, E. J.; Hester, J. J.; Holtzman, J. A.; Light, R. M.; O'Neil Jr, E. J.; Shaya, E. J.; Westphal, J. A. (1992). "Planetary camera observations of the central parsec of M32" (PDF). Astronomical Journal. 104: 552–562. Bibcode:1992AJ....104..552L. doi:10.1086/116254. ^ Kepple, George Robert; Sanner, Glen W. (1998). The Night Sky Observer's Guide. Vol. 1. Willmann-Bell. p. 17. ISBN 978-0-943396-58-3. ^ Faber, S. M. (1973). "Tidal Origin of Elliptical Galaxies of High Surface Brightness". Astrophysical Journal. 179: 423–426. Bibcode:1973ApJ...179..423F. doi:10.1086/151881. ^ Bekki, Kenji; Couch, Warrick J.; Drinkwater, Michael J.; Gregg, Michael D. (2001). "A New Formation Model for M32: A Threshed Early-Type Spiral Galaxy?" (PDF). Astrophysical Journal Letters. 557 (1): L39. arXiv:astro-ph/0107117. Bibcode:2001ApJ...557L..39B. doi:10.1086/323075. ^ Graham, A. W. (2002). "Evidence for an Outer Disk in the Prototype Compact Elliptical Galaxy M32". Astrophysical Journal Letters. 568 (1): L13–L17. arXiv:astro-ph/0202307. Bibcode:2002ApJ...568L..13G. doi:10.1086/340274. ^ Dierickx, M.; Blecha, L.; Loeb, A. (2014). "Signatures of the M31-M32 Galactic Collision". Astrophysical Journal. 788 (2): L38. arXiv:1405.3990. Bibcode:2014ApJ...788L..38D. doi:10.1088/2041-8205/788/2/L38. ^ Choi, P. I.; Guhathakurta, P.; Johnston, K. V. (2002). "Tidal Interaction of M32 and NGC 205 with M31: Surface Photometry and Numerical Simulations". Astronomical Journal. 124 (1): 310–331. arXiv:astro-ph/0111465. Bibcode:2002AJ....124..310C. doi:10.1086/341041. ^ Huxor, A. P.; Phillipps, S.; Price, J. (2013). "Discovery of an isolated compact elliptical galaxy in the field". Monthly Notices of the Royal Astronomical Society. 430 (3): 1956–1960. arXiv:1302.6520. Bibcode:2013MNRAS.430.1956H. doi:10.1093/mnras/stt014. ^ "The Milky Way's long-lost sibling finally found". University of Michigan News. 2018-07-23. Retrieved 2018-07-23. ^ D’Souza, Richard; Bell, Eric F. (2018-07-23). "The Andromeda galaxy's most important merger about 2 billion years ago as M32's likely progenitor". Nature Astronomy. 2 (9): 737–743. arXiv:1807.08819. Bibcode:2018NatAs...2..737D. doi:10.1038/s41550-018-0533-x. ISSN 2397-3366. ^ Ford, H. C.; Jacoby, G. H.; Jenner, D. C. (1978). "Planetary nebulae in local group galaxies. VI - an observational determination that M32 is in front of M31". Astrophysical Journal. 223: 94–97. Bibcode:1978ApJ...223...94F. doi:10.1086/156239. ^ van Dokkum, P. G.; Franx, M. (1995). "Dust in the Cores of Early-Type Galaxies". Astronomical Journal. 110: 2027. arXiv:astro-ph/9507101. Bibcode:1995AJ....110.2027V. doi:10.1086/117667. ^ Paulin-Henriksson, S.; Baillon, P.; Bouquet, A.; Carr, B. J.; Creze, M.; Evans, N. W.; Giraud-Heraud, Y.; Gould, A.; Hewett, P.; Kaplan, J.; Kerins, E.; Lastennet, E.; Le Du, Y.; Melchior, A.-L.; Smartt, S. J.; Valls-Gabaud, D.; Point-Agape Collaboration (2002). "A Candidate M31/M32 Intergalactic Microlensing Event". Astrophysical Journal Letters. 576 (2): L121–L124. arXiv:astro-ph/0206387. Bibcode:2002ApJ...576L.121P. doi:10.1086/343887. ^ Tonry, J. L. (1984). "Evidence for a central mass concentration in M32". Astrophysical Journal Letters. 283: L27. Bibcode:1984ApJ...283L..27T. doi:10.1086/184326. ^ Bender, R.; Kormendy, J.; Dehnen, W. (1996). "Improved Evidence for a 3×106 M⊙ Black Hole in M32: Canada-France-Hawaii Telescope Spectroscopy with FWHM = 0.47" Resolution". Astrophysical Journal Letters. 464 (2): L123–L126. Bibcode:1996ApJ...464L.123B. doi:10.1086/310098. ^ Joseph, C. L.; Merritt, D.; Olling, R.; Valluri, M.; Bender, R.; Bower, G.; Danks, A.; Gull, T.; Hutchings, J.; Kaiser, M. E.; Maran, S.; Weistrop, D.; Woodgate, B.; Malumuth, E.; Nelson, C.; Plait, P.; Lindler, D. (2001). "The Nuclear Dynamics of M32. I. Data and Stellar Kinematics". Astrophysical Journal. 550 (2): 668–690. arXiv:astro-ph/0005530. Bibcode:2001ApJ...550..668J. doi:10.1086/319781. ^ Verolme, E. K.; Cappellari, M.; Copin, Y.; van der Marel, R. P.; Bacon, R.; Bureau, M.; Davies, R. L.; Miller, B. M.; de Zeeuw, P. T. (2002). "A SAURON study of M32: measuring the intrinsic flattening and the central black hole mass". Monthly Notices of the Royal Astronomical Society. 335 (3): 517–525. arXiv:astro-ph/0201086. Bibcode:2002MNRAS.335..517V. doi:10.1111/j.1365-2966.2009.15832.x. ^ Valluri, M.; Merritt, D.; Emsellem, E. (2004). "Difficulties with Recovering the Masses of Supermassive Black Holes from Stellar Kinematical Data". Astrophysical Journal. 602 (1): 66–92. arXiv:astro-ph/0210379. Bibcode:2004ApJ...602...66V. doi:10.1086/380896. ^ van den Bosch, R. C. E.; de Zeeuw, P. T. (2010). "Estimating black hole masses in triaxial galaxies". Monthly Notices of the Royal Astronomical Society. 401 (3): 1770–1780. arXiv:0910.0844. Bibcode:2010MNRAS.401.1770V. doi:10.1111/j.1365-2966.2009.15832.x. ^ Ho, Luis C.; Terashima, Yuichi; Ulvestad, James S. (2003). "Detection of the "Active" Nucleus of M32". Astrophysical Journal. 589 (2): 783–789. arXiv:astro-ph/0303060. Bibcode:2003ApJ...589..783H. doi:10.1086/374738. ^ Yang, Yang; Li, Zhiyuan; Sjouwerman, Loránt O.; Wang, Q. Daniel; Gu, Qiusheng; Kraft, Ralph P.; Yuan, Feng (2015). "Detection of a Compact Nuclear Radio Source in the Local Group Elliptical Galaxy M32". Astrophysical Journal Letters. 807 (1): L19. arXiv:1502.03231. Bibcode:2015ApJ...807L..19Y. doi:10.1088/2041-8205/807/1/L19. Wikimedia Commons has media related to Messier 32. Merrifield, Michael. "M32 – Dwarf Elliptical". Deep Sky Videos. Brady Haran.